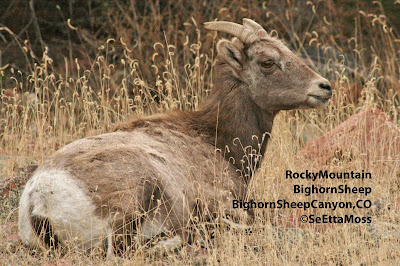 These are a few of a herd of 8+ Rocky Mtn bighorn sheep I spotted grazing not far off of H50 in Bighorn Sheep Canyon which begins about 11 miles east of my town, Canon City, CO. Note the gorgeous native blue grama grass that surrounds the ewe in the top pic--this location is BLM lands and our public lands can protect our native ecosystems as has been done in this location. 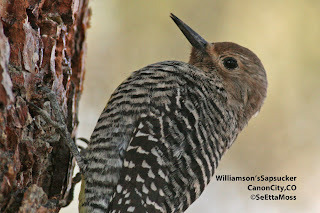 Double-click on this and the other sapsucker pics I posted today for super close-up views. 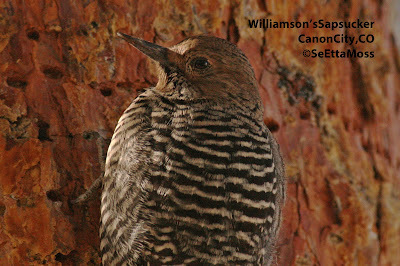 Today I found both a male and a female Williamson's Sapsucker in the town of Florence as well as 4 female and 2 male Williamson's Sapsuckers in Canon City including this female. 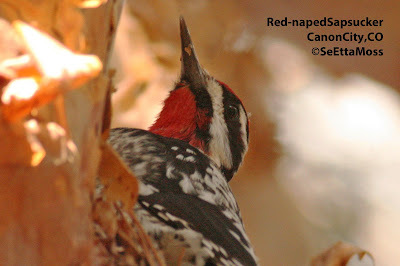 I was surprised just how different these three pics of the same sapsucker look--I took all within one minute but the sun really made a difference in the lighting. After being careful in looking for those sapsuckers that are overwintering so as not to interfere with feeding or flush them (using valuable energy to escape) after the extremely harsh weather recently, I was less reticent to do a more complete survey as part of the Great Backyard Bird Count, since the weather has been much warmer for over a week (sap appears to be flowing again and not frozen). This is a PBS video.